Not to be confused with Ivory-billed woodcreeper. The ivory-billed woodpecker (Campephilus principalis) is one of the largest woodpeckers in the world, at roughly 20 inches (51 cm) long and 30 inches (76 cm) in wingspan. It is native to types of virgin forest ecosystems found in the Southeastern United States and Cuba. Habitat destruction and, to a lesser extent, hunting have decimated populations so thoroughly that the species is very probably extinct, though sporadic reports of sightings have continued into the 21st century. The ivory-billed woodpecker, dubbed the "holy grail bird" due to its appearance and behavior, is the subject of many rediscovery efforts and much speculation. The species is listed as critically endangered by the International Union for Conservation of Nature. The American Birding Association lists the ivory-billed woodpecker as a class 6 species, a category it defines as "definitely or probably extinct". Reports of at least one male ivory-billed woodpecker in Arkansas in 2004 were investigated and subsequently published in April 2005 by a team led by the Cornell Lab of Ornithology. No definitive confirmation of those reports emerged, despite intensive searching over five years following the initial sightings. An anonymous $10,000 reward was offered in June 2006 for information leading to the discovery of an ivory-billed woodpecker nest, roost, or feeding site. In December 2008, the Nature Conservancy announced a reward of $50,000 to the person who can lead a project biologist to a living ivory-billed woodpecker. In late September 2006, a team of ornithologists from Auburn University and the University of Windsor published reports of their own sightings of ivory-billed woodpeckers along the Choctawhatchee River in northwest Florida, beginning in 2005. These reports were accompanied by evidence that the authors themselves considered suggestive for the existence of ivory-billed woodpeckers. Searches in this area of Florida through 2009 failed to produce definitive confirmation. In January 2017, a scientist at the Naval Research Laboratory published a report of 10 sightings of ivory-billed woodpeckers, including nine in the Pearl River along the Louisiana-Mississippi border and one in the Choctawhatchee River. Three of the claimed sightings are shown in video footage of birds with flights, behaviors, field marks, and other characteristics that the author claims are not consistent with any species of the region other than the ivory-billed woodpecker. Nobody has managed to obtain indisputable photographic evidence for the persistence of the ivory-billed woodpecker, but the paper contains an analysis based on factors related to behavior and habitat suggesting that such evidence is unlikely to be obtained in time to make a difference in the conservation of this species. The identification has been received with skepticism. Despite published reports from Arkansas, Florida, and Louisiana, and sporadic reports elsewhere in the historic range of the species since the 1940s, no universally accepted evidence exists for the continued existence of the ivory-billed woodpecker; i.e., no undisputed photographs, videos, specimens or DNA samples from feathers or feces of the ivory-billed woodpecker are available. Land acquisition and habitat restoration efforts have been initiated in certain areas where a relatively high probability exists that the species might survive to protect any possible surviving individuals. Campephilus is a genus of woodpecker sometimes called the ivory-billed woodpecker, although the term is more commonly used to describe the American and Cuban ivory-billed woodpeckers. Cuban ivory-billed woodpecker (Campephilus principalis bairdii or Campephilus bairdii), is now believed to be extinct. American ivory-billed woodpecker (Campephilus principalis principalis or Campephilus principalis), is described here. The ivory-billed woodpecker is the type species for the genus Campephilus, a group of large American woodpeckers. Although they look very similar to the pileated woodpeckers, they are not close relatives as the pileated is a member of the genus Dryocopus. Ornithologists have traditionally recognized two subspecies of this bird: the American ivory-billed, the more famous of the two, and the Cuban ivory-billed woodpecker. The two look similar despite differences in size and plumage. Some controversy exists over whether the Cuban ivory-billed woodpecker is more appropriately recognized as a separate species. A recent study compared DNA samples taken from specimens of both ivory-billed birds along with the imperial woodpecker, a larger but otherwise very similar bird. It concluded not only that the Cuban and American ivory-billed woodpeckers are genetically distinct, but also that they and the imperial form a North American clade within Campephilus that appeared in the mid-Pleistocene. The study does not attempt to define a lineage linking the three birds, though it does imply that the Cuban bird is more closely related to the imperial. The American Ornithologists' Union Committee on Classification and Nomenclature has said it is not yet ready to list the American and Cuban as separate species. Lovette, a member of the committee, said that more testing is needed to support that change, but concluded, "These results will likely initiate an interesting debate on how we should classify these birds." While recent evidence possibly suggesting that American ivory-billed woodpeckers still exist in the wild has caused excitement in the ornithology community, no similar evidence exists for the Cuban ivory-billed bird, believed to be extinct since the last sighting in the late 1980s. The ivory-billed woodpecker was the largest woodpecker in the United States. The closely related and likewise probably extinct imperial woodpecker (C. imperialis) of western Mexico is, or was, the largest woodpecker. The ivory-billed has a total length of 48 to 53 cm (19 to 21 in), and based on scant information, weighs about 450 to 570 g (0.99 to 1.26 lb). It has a typical 76 cm (30 in) wingspan. Standard measurements attained included a wing chord length of 23.5–26.5 cm (9.3–10.4 in), a tail length of 14–17 cm (5.5–6.7 in), a bill length of 5.8–7.3 cm (2.3–2.9 in), and a tarsus length of 4–4.6 cm (1.6–1.8 in). The bird is sexually dimorphic, as seen in the picture to the right. It is shiny blue-black with white markings on its neck and back and extensive white on the trailing edge of both the upper- and underwing. The underwing is also white along its forward edge, resulting in a black line running along the middle of the underwing, expanding to more extensive black at the wingtip. In adults, the bill is ivory in color, and chalky white in juveniles. Ivory-bills have a prominent crest, although in juveniles it is ragged. The crest is black in juveniles and females. In males, the crest is black along its forward edge, changing abruptly to red on the side and rear. The chin of an ivory-billed woodpecker is black. When perched with the wings folded, birds of both sexes present a large patch of white on the lower back, roughly triangular in shape. These characteristics distinguish them from the smaller and darker-billed pileated woodpecker. The pileated woodpecker normally is brownish-black, smoky, or slaty black in color. It also has a white neck stripe, but the back is normally black. Pileated woodpecker juveniles and adults have a red crest and a white chin. Pileated woodpeckers normally have no white on the trailing edges of their wings and when perched, normally show only a small patch of white on each side of the body near the edge of the wing. However, pileated woodpeckers, apparently aberrant individuals, have been reported with white trailing edges on the wings, forming a white triangular patch on the lower back when perched. Like all woodpeckers, the ivory-billed woodpecker has a strong and straight bill and a long, mobile, hard-tipped, barbed tongue. Among North American woodpeckers, the ivory-billed woodpecker is unique in having a bill whose tip is quite flattened laterally, shaped much like a beveled wood chisel. Overall it is a very large and distinctive woodpecker with a charismatic, very clean and smooth appearance. The bird's drum is a single or double rap. Four fairly distinct calls are reported in the literature and two were recorded in the 1930s. The most common, a kent or hant, sounds like a toy trumpet often repeated in a series. When the bird is disturbed, the pitch of the kent note rises, it is repeated more frequently, and it is often doubled. A conversational call, also recorded, is given between individuals at the nest, and has been described as kent-kent-kent. A recording of the bird, made by Arthur A. Allen, can be found here. The ivory-billed woodpecker is sometimes referred to as the holy grail bird (because of its rarity and elusiveness) and the Lord God bird or the Good God bird (both based on the exclamations of awed onlookers). Other nicknames for the bird are the King of the Woodpeckers and Elvis in Feathers. Ivory-billed woodpeckers are known to prefer thick hardwood swamps and pine forests, with large amounts of dead and decaying trees. Prior to the American Civil War, much of the Southern United States was covered in vast and continuous primeval hardwood forests that were suitable as habitat for the bird. At that time, the ivory-billed woodpecker ranged from east Texas to North Carolina, and from southern Illinois to Florida and Cuba. After the Civil War, the timber industry deforested millions of acres in the South, leaving only sparse isolated tracts of suitable habitat. The ivory-billed woodpecker feeds mainly on the large larvae of certain wood-boring beetles, but also eats seeds, fruit, and other insects. The bird uses its enormous bill to hammer, wedge, and peel the bark off dead trees to find the insects. These birds need about 25 km2 (9.7 sq mi) per pair to find enough food to feed their young and themselves. Hence, they occur at low densities even in healthy populations. Detailed information can be found in the book The Race to Save the Lord God Bird. The last areas to have the bird, including the Singer Tract, were described to be incredible and primeval landscapes of old-growth swamp and forest, remnants of the eastern wilderness. They often had other disappearing species of similar habitat such as the red wolf and eastern cougar. Usually two to five eggs are laid and incubated for 3 to 5 weeks. Parents incubate the eggs co-operatively, with the male incubating from about 4:30 pm to 6:30 am, while the female foraged, and vice versa from 6:30 am to 4:30 pm. They feed the chicks for months. Young learn to fly about 7 to 8 weeks after hatching. The parents continue feeding them for another two months. The family eventually splits up in late fall or early winter. Ornithologists speculate that they may live as long as 30 years. Heavy logging activity exacerbated by hunting by collectors devastated the population of ivory-billed woodpeckers in the late 19th century. It was generally considered extinct in the 1920s when a pair turned up in Florida, only to be shot for specimens. In 1932, a Louisiana state representative, Mason Spencer of Tallulah, disproved premature reports of the demise of the species when, armed with a gun and a hunting permit, he killed an ivory-billed woodpecker along the Tensas River and took the specimen to his state wildlife office in Baton Rouge. By 1938, an estimated 20 woodpeckers remained in the wild, some six to eight of which were in the old-growth forest called the Singer Tract, owned by the Singer Sewing Company in Madison Parish in northeastern Louisiana, where logging rights were held by the Chicago Mill and Lumber Company. The company brushed aside pleas from four Southern governors and the National Audubon Society with extensive field studies and a report that the tract be publicly purchased and set aside as a reserve. By 1944, the last known ivory-billed woodpecker, a female, was gone from the cut-over tract. The first audio and only motion picture recording made of the ivory-billed woodpecker was created as part of a 1935 study by a group of Cornell scientists in the Singer Tract in Madison Parish, Louisiana. The ivory-billed woodpecker was listed as an endangered species on 11 March 1967, though the only evidence of its existence at the time was a possible recording of its call made in East Texas. The last reported sighting of the Cuban subspecies (C. p. bairdii), after a long interval, was in 1987; it has not been seen since. The Cuban exile journalist and author John O'Donnell-Rosales, who was born in the area of Cuba with the last confirmed sightings, reported sightings near the Alabama coastal delta in 1994, but these were never properly[clarification needed] investigated by state wildlife officials. Two photos were given to Louisiana State University museum director George Lowery in 1971 by a source who wished to remain anonymous, but came forward in 2005 as outdoorsman Fielding Lewis. The photos, taken with a cheap Instamatic camera, show what appears to be a male ivory-billed woodpecker perched on the trunks of two trees in the Atchafalaya Basin of Louisiana. The bird's distinctive bill is not visible in either photo and the photos – taken from a distance – are very grainy. Lowery presented the photos at the 1971 annual meeting of the American Ornithologists Union. Skeptics dismissed the photos as frauds; seeing that the bird is in roughly the same position in both photos, they suggested they may have been of a mounted specimen. Numerous unconfirmed reports of the bird remain, but many ornithologists believe the species had been wiped out completely, and it was assessed as "extinct" by the International Union for Conservation of Nature and Natural Resources in 1994. This assessment was later altered to "critically endangered" on the grounds that the species could still be extant. In 1999, an unconfirmed sighting of a pair of birds was made in the Pearl River region of southeast Louisiana by a forestry student, David Kulivan, which some experts considered very compelling. In a 2002 expedition in the forests, swamps, and bayous of the Pearl River Wildlife Management Area by LSU, biologists spent 30 days searching for the bird. On the afternoon of 27 January 2002, after 10 days, a rapping sound similar to the "double knock" made by the ivory-billed woodpecker was heard and recorded. The exact source of the sound was not found because of the swampy terrain, but signs of active woodpeckers were found (i.e., scaled bark and large tree cavities). The expedition was inconclusive, however, as the recorded sounds were likely gunshot echoes rather than the distinctive double rap of the ivory-billed woodpecker. A group of 17 authors headed by the Cornell Lab of Ornithology (CLO) reported the discovery of at least one ivory-billed woodpecker, a male, in the Big Woods area of Arkansas in 2004 and 2005, publishing the report in the journal Science on 28 April 2005. One of the authors, who was kayaking in the Cache River National Wildlife Refuge, Monroe County, Arkansas, on 11 February 2004, reported on a website the sighting of an unusually large red-crested woodpecker. This report led to more intensive searches in the area and in the White River National Wildlife Refuge, undertaken in secrecy for fear of a stampede of bird-watchers, by experienced observers over the next 14 months. About 15 sightings occurred during the period (seven of which were considered compelling enough to mention in the scientific article), possibly all of the same bird. One of these more reliable sightings was on 27 February 2004. Bobby Harrison of Huntsville, Alabama, and Tim Gallagher of Ithaca, New York, both reported seeing an ivory-billed woodpecker at the same time. The secrecy of the search permitted The Nature Conservancy and Cornell University to quietly buy up ivory-billed woodpecker habitat to add to the 120,000 acres (490 km2) of the Big Woods protected by the conservancy. A large woodpecker was videotaped on 25 April 2004; its size, wing pattern at rest and in flight, and white plumage on its back between the wings were cited as evidence that the woodpecker sighted was an ivory-billed woodpecker. That same video included an earlier image of what was suggested to be such a bird perching on a water tupelo (Nyssa aquatica). The report also notes that drumming consistent with that of ivory-billed woodpecker had been heard in the region. It describes the potential for a thinly distributed population in the area, though no birds have been located away from the primary site. In the fall of 2006, researchers developed and installed an "autonomous observatory" using robotic video cameras with image processing software that detects and records high-resolution video of birds in flight inside a high-probability zone in the Cache River area. As of August 2007, hundreds of birds have been recorded, including pileated woodpeckers, but not the ivory-billed woodpecker. In June 2005, ornithologists at Yale University, the University of Kansas, and Florida Gulf Coast University prepared a scientific paper skeptical of the initial reports of rediscovery. We were very skeptical of the first published reports, and ... data were not sufficient to support this startling conclusion. The paper was not published. Questions about the evidence for ivory-billed woodpecker persisted. The CLO authors could not say with absolute certainty that the sounds recorded in Arkansas were made by ivory-billed woodpeckers. Some skeptics, including Richard Prum, believe the video could have been of a pileated woodpecker. Prum, intrigued by some of the recordings taken in Arkansas' Big Woods, said the evidence thus far is refutable. The American Birding Association Checklist Committee has not changed the status of the Ivory-billed Woodpecker from Code 6 (Extinct) to another level that would reflect a small surviving population. The Committee is waiting for unequivocal proof that the species still exists. Prum, Robbins, Brett Benz, and I remain steadfast in our belief that the bird in the Luneau video is a normal pileated woodpecker. Others have independently come to the same conclusion, and publication of independent analyses may be forthcoming [...] For scientists to label sight reports and questionable photographs as 'proof' of such an extraordinary record is delving into 'faith-based' ornithology and doing a disservice to science." Fitzpatrick and co-authors responded with a lengthy piece in the same scientific journal, protesting Jackson's harsh language, dismissive tone, "factual errors", and "poorly substantiated opinions" about the original paper. One of the most rancorous debates in the history of ornithology had begun in earnest. The two sides each published additional responses that seemed, to many ornithological observers, to have departed markedly from accepted scientific decorum. Jackson accused the Fitzpatrick team of "untruths", and Fitzpatrick accused Jackson of obviating the normal peer-review system with an opinion piece "treated as a scientific contribution by the public media." Claims that the bird in the Luneau video is a normal pileated woodpecker are based on misrepresentations of a pileated's underwing pattern, interpretation of video artifacts as plumage pattern, and inaccurate models of takeoff and flight behavior. These claims are contradicted by experimental data and fail to explain evidence in the Luneau video of white dorsal plumage, distinctive flight behavior, and a perched woodpecker with white upper parts." In sum, no evidence confirms the alleged rediscovery of the ivory-billed woodpecker. Indeed, confidence in the claim has eroded with failure to verify its existence despite massive searches. New video analysis of pileated woodpeckers in escape flights comparable to that of the putative ivory-billed woodpecker filmed in Arkansas shows that pileated woodpeckers can display a wingbeat frequency equivalent to that of the Arkansas bird during escape flight. 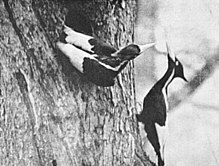 The critical frames from the Arkansas video that were used to identify the bird as an ivory-billed woodpecker are shown to be equally, or more, compatible with the pileated woodpecker.…The identification of the bird filmed in Arkansas in April 2004 as an ivory-billed woodpecker is best regarded as unsafe. The similarities between the Arkansas bird and known pileated woodpeckers suggest that it was most likely a pileated woodpecker. All ARU double raps suggesting the presence of an ivory-billed woodpecker should be reconsidered in light of the phenomenon of duck wingtip collisions, especially those recorded in the winter months, when duck flocks are common across flooded bottomlands of the southeastern United States. The search teams covered lots of ground and tried new survey techniques…. Searchers documented more possible sightings and possible ivory-bill double knocks heard, but the definitive photograph, like the bird itself, remained elusive. There will be a distinctly different flavor to this season’s search for the ivory-billed woodpecker. Seven members of the Cornell Lab of Ornithology’s mobile search team will plunge into some of the most forbidding wilderness in southwestern Florida. …The work begins in Florida in early January and continues through mid-March. …In mid-March the Cornell Lab of Ornithology team will join the South Carolina search along the Congaree, PeeDee, and Santee Rivers. We have found no signs of ivory-billed woodpeckers. No sightings, double knocks or calls, no replies to our many double-knock imitations. We have seen a few cavities of the appropriate size and shape for ivory-bills, but these can be old, or exceptionally large pileated woodpecker cavities, or mammal-enlarged pileated woodpecker cavities.… Given the results, it is unlikely a population of any meaningful size of ivory-billed woodpeckers exists in south Florida. But after five years of fruitless searching, hopes of saving the species have faded. "We don't believe a recoverable population of ivory-billed woodpeckers exists," says Ron Rohrbaugh, a conservation biologist at Cornell University in Ithaca, New York, who headed the original search team. RC 06-610. Ivory-billed Woodpecker, Campephilus principalis. 21 May 2005 – 26 April 2006. Choctawhatchee River, Washington/Bay/Walton cos. A population of unknown size has been reported by a team from Auburn University from the lower Choctawhatchee River. There have been a few sightings but no photographs, some interesting recordings of “kent” calls and of double rap drums, and photographs taken of cavities and bark scaling. These observations were made on the heels of the much-publicized “rediscovery” of the species in Arkansas (Fitzpatrick et al. 2005). The species had not been documented to occur since 1944. The video documentation of the bird(s) from Arkansas, however, has been debated by many, although the record was accepted by the Arkansas Bird Records Committee. Our Committee felt that given the controversy of the Arkansas evidence, the species is best considered still extinct. Therefore only evidence that undoubtedly showed a living bird would be considered sufficient to accept a report. The last specimen taken in Florida was in 1925; there have been numerous sight reports of varying credibility since, and one record of a feather found in a nest cavity in 1968 that was identified as an ivory-billed woodpecker inner secondary by Alexander Wetmore. (12 June 2008) We completed our 2008 effort to get definitive evidence for ivorybills in the Choctawhatchee River Basin in early May…. Team members had no sightings of ivorybills and only two sound detections in 2008.… So where does all this leave us? Pretty much in the same position as in June 2006. We have a large body of evidence that Ivory-billed Woodpeckers persist along the Choctawhatchee River in the Florida panhandle, but we do not have definitive proof that they exist. Either the excitement of the ivorybill hunt causes competent birders to see and hear things that do not exist and leads competent sound analysts to misidentify hundreds of recorded sounds, or the few ivorybills in the Choctawhatchee River Basin are among the most elusive birds on the planet. (9 February 2009) There has been little to report, and my students and I [Geoff Hill] have been enjoying the calm. We continue to work to get definitive documentation of the ivory-billed woodpecker in the Choctawhatchee River Basin.… To my knowledge, there have been no sightings of ivory-billed woodpeckers in the Choctawhatchee region since last spring. There were a few double knock detections in January, but not by my paid crew, Brian [Rolek], or me. (2 August 2009) I haven’t posted many updates on this site in the past 9 months because there hasn’t not [sic] been much to report.… Since the winter of 2008, we have had few sightings or sound detections by anyone—none by Brian or me—and none that I would rate very highly.… In short, our experience over the past year indicates that ivorybills have moved out of the areas where we encountered them from 2005 to 2008.… There is no way to know whether the birds are in different areas in the Choctawhatchee Basin, different forests in the region, or dead.…I won’t post any more updates on this site. Dr. Michael Collins reported nine sightings of ivory-billed woodpeckers in the Pearl River in Louisiana in 2006 and 2008, including an encounter in which kent calls came from two directions at the same time, and an additional sighting (of two birds) in the Choctawhatchee River in 2007. Three of these sightings are supported by video evidence. Additional analysis of these videos was published in an earlier paper, along with comments by independent experts. Bret Tobalske, an ornithologist who specializes in the flight mechanics of woodpeckers, performed an analysis of wing motion and concluded that the bird in the 2008 video is a large woodpecker. Only two large woodpeckers occur north of Mexico, but the flap rate is about ten standard deviations greater than the mean flap rate of the pileated woodpecker. The flight speed, narrow wings, and prominent white patches on the dorsal surfaces of the wings are also consistent with the ivory-billed but not the pileated woodpecker. Avian artist Julie Zickefoose analyzed the 2006 video and commented on the "rared-back pose, long but fluffy and squared-off crest, and extremely long, erect head and neck" and an unusual short flight that does not seem to be consistent with a pileated woodpecker. A size comparison was carried out using part of the tree in which the bird in the 2006 video was perched. Two forks made it possible to scale frames from the video relative to a photo of a pileated woodpecker specimen that was mounted on the tree. On the basis of the comparison, it is clear that the bird in the video is a large woodpecker, and the size appears to be consistent with an ivory-billed woodpecker. The 2007 video shows events involving a woodpecker delivering a blow that is accompanied by an audible double knock, unusual swooping flights that are consistent with historical accounts of the ivory-billed woodpecker, and a takeoff with deep and rapid flaps that are similar to the flaps of the closely related imperial woodpecker (Campephilus imperialis) taking off. In economically struggling east Arkansas, the speculation of a possible return of the ivory-billed woodpecker has served as a great source of economic exploitation, with tourist spending up 30%, primarily in and around the city of Brinkley, Arkansas. A woodpecker "festival", a woodpecker hairstyle (a sort of mohawk with red, white, and black dye), and an "Ivory-bill Burger" (made with 100% beef) have been featured locally. The lack of confirmed proof of the bird's existence, and the extremely small chance of actually seeing the bird even if it does exist (especially since the exact locations of the reported sightings are still guarded), have prevented the rise in tourism that some locals had anticipated. Brinkley hosted "The Call of the Ivory-billed Woodpecker Celebration" in February 2006. The celebration included exhibits, birding tours, educational presentations, a vendor market and more. Interviews with residents of Brinkley, Arkansas, heard on National Public Radio following the reported rediscovery were shared with musician Sufjan Stevens, who used the material to write a song titled "The Lord God Bird". The Alex Karpovsky film Red Flag features Karpovsky as a filmmaker touring his documentary about the ivory-billed woodpecker, which is also a film he actually made titled Woodpecker. Arkansas has made license plates featuring a graphic of an ivory-billed woodpecker. ^ a b c BirdLife International (2016). "Campephilus principalis". IUCN Red List of Threatened Species. Version 2013.2. International Union for Conservation of Nature. Retrieved 10 June 2018. ^ "Ivory-billed Woodpecker Campephilus principalis". Retrieved 24 October 2018. ^ "Annual Report of the ABA Checklist Committee: 2007 – Flight Path" (PDF). Retrieved 13 November 2012. ^ a b Fitzpatrick, J. W.; Lammertink, M; Luneau Jr, M. D.; Gallagher, T. W.; Harrison, B. R.; Sparling, G. M.; Rosenberg, K. V.; Rohrbaugh, R. W.; Swarthout, E. C.; Wrege, P. H.; Swarthout, S. B.; Dantzker, M. S.; Charif, R. A.; Barksdale, T. R.; Remsen Jr, J. V.; Simon, S. D.; Zollner, D (2005). "Ivory-billed Woodpecker (Campephilus principalis) Persists in Continental North America" (PDF). Science. 308 (5727): 1460–2. doi:10.1126/science.1114103. PMID 15860589. ^ "Wildlife Group Proposes $10,000 Reward For Ivory-billed Evidence". Eyewitness News everywhere. Clear Channel Broadcasting. 21 June 2006. Archived from the original on 28 August 2006. Retrieved 8 July 2006. ^ a b c Collins, Michael D. (2017). "Video evidence and other information relevant to the conservation of the Ivory-billed Woodpecker (Campephilus principalis)". Heliyon. 3 (1): e00230. doi:10.1016/j.heliyon.2017.e00230. PMC 5282651. PMID 28194452. ^ Michelle Donahue (25 January 2017). "Possible Ivory-Billed Woodpecker Footage Breathes Life Into Extinction Debate". Audubon Society. ^ a b Robert C. Fleischer; Jeremy J. Kirchman; John P. Dumbacher; Louis Bevier; Carla Dove; Nancy C. Rotzel; Scott V. Edwards; Martjan Lammertink; Kathleen J. Miglia; William S. Moore (2006). "Mid-Pleistocene divergence of Cuban and North American ivory-billed woodpeckers". Biology Letters. 2 (3): 466–469. doi:10.1098/rsbl.2006.0490. PMC 1686174. PMID 17148432. ^ Leonard, Pat; Chu, Miyoko (Autumn 2006). "DNA Fragments Yield Ivory-bill's Deep History". BirdScope. Cornell Lab of Ornithology. 20 (4). Archived from the original on 5 June 2011. ^ Winkler, Hans; Christie, David A. & Nurney, David (1995). Woodpeckers: An Identification Guide to the Woodpeckers of the World. Houghton Mifflin. ISBN 978-0-395-72043-1. ^ Hoose, Phillip M. (2004). The Race to Save the Lord God Bird. Douglas & McIntyre. ISBN 978-0-374-36173-0. They gave it names like 'Lord God bird' and 'Good God bird'. ^ Steinberg, Michael K. (2008). Stalking the Ghost Bird: The Elusive Ivory-Billed Woodpecker in Louisiana. LSU Press. ISBN 978-0-8071-3305-7. Nicknamed the 'Lord God Bird', the 'Grail Bird', 'King of the Woodpeckers', and 'Elvis in Feathers', the ivory-bill – thought to be extinct since the 1940s – fascinates people from all walks of life and has done so for centuries. ^ Jackson, Jerome (2002). "Ivory-billed Woodpecker". Birds of North America Online. Retrieved 11 October 2009. ^ Allen, Arthur A.; Kellog, P. Paul (1937). "Recent Observations on the Ivory-Billed Woodpecker". Auk. 54 (2): 164–184. doi:10.2307/4078548. JSTOR 4078548. ^ "Ecology and Behavior". The Cornell Lab of Ornithology. ^ "Studying a Vanishing Bird". The Cornell Lab of Ornithology. ^ "History of the Ivorybill: The Ivory-billed Woodpecker (Campephilus principalis), one of the largest woodpeckers known ... has become elusive to ornithologists as well as birdwatchers". ivorybill.org. Retrieved 24 July 2013. ^ Weidensaul, Scott (2005): Ghost of a chance. Smithsonian Magazine. August 2005: 97–102. ^ Morris, Tim (9 January 2006). "the grail bird". lection. Retrieved 8 July 2006. ^ Mendenhall, Matt (2005). "Reported Ivory-bill Sightings Since 1944". Birders World Magazine. Archived from the original on 15 June 2006. Retrieved 8 July 2006. ^ Mayell, Hillary (20 February 2002). ""Extinct" Woodpecker Still Elusive, But Signs Are Good". National Geographic News. National Geographic. Retrieved 8 July 2006. ^ Fitzpatrick, John W. (Summer 2002). "Ivory-bill Absent from Sounds of the Bayous". Birdscope. Cornell Lab of Ornithology. Archived from the original on 12 July 2006. Retrieved 8 July 2006. ^ "Listening for the Ivory-bill". Cornell Lab of Ornithology. Summer 2005. Archived from the original on 10 October 2006. Retrieved 25 March 2009. ^ Dalton, Rex (2 August 2005). "Ivory-billed woodpecker raps on". BioEd Online. Retrieved 9 July 2006. ^ a b Jackson, J. A. (2006). "Ivory-Billed Woodpecker (Campephilus principalis): Hope, and the Interfaces of Science, Conservation, and Politics" (PDF). The Auk. 123: 1. doi:10.1642/0004-8038(2006)123[0001:IWCPHA]2.0.CO;2. Archived from the original (PDF) on 13 June 2006. ^ Fitzpatrick, J. W.; Lammertink, M.; Luneau, M. D.; Gallagher, T. W.; Harrison, B. R.; Sparling, G. M.; Rosenberg, K. V.; Rohrbaugh, R. W.; Swarthout, E. C. H.; Wrege, P. H.; Swarthout, S. B.; Dantzker, M. S.; Charif, R. A.; Barksdale, T. R.; Remsen, J. V.; Simon, S. D.; Zollner, D. (2006). "Clarifications about current research on the status of Ivory-billed Woodpecker (Campephilus principalis) in Arkansas". The Auk. 123 (2): 587. doi:10.1642/0004-8038(2006)123[587:CACROT]2.0.CO;2. ^ Sibley, D. A. (2006). "Comment on "Ivory-billed Woodpecker (Campephilus principalis) Persists in Continental North America"" (PDF). Science. 311 (5767): 1555a. doi:10.1126/science.1122778. PMID 16543443. Archived from the original (PDF) on 2 May 2015. Retrieved 29 August 2015. ^ a b Fitzpatrick, J. W. (2006). "Response to Comment on "Ivory-billed Woodpecker (Campephilus principalis) Persists in Continental North America"". Science. 311 (5767): 1555b. doi:10.1126/science.1123581. ^ Bevier, Louis (14 August 2007). "Ivory-billed debate". Archived from the original on 2 March 2009. Retrieved 25 March 2009. ^ Collinson, J Martin (March 2007). "Video analysis of the escape flight of Pileated Woodpecker Dryocopus pileatus: does the Ivory-billed Woodpecker Campephilus principalis persist in continental North America?". BMC Biology. 5: 8. doi:10.1186/1741-7007-5-8. PMC 1838407. PMID 17362504. ^ Jones, Clark D.; Jeff R. Troy; Lars Y. Pomara (June 2007). "Similarities between Campephilus woodpecker double raps and mechanical sounds produced by duck flocks". The Wilson Journal of Ornithology. 119 (2): 259–262. doi:10.1676/07-014.1. ^ "Ivory-billed woodpecker search season ends". Cornell Lab of Ornithology. 18 May 2006. Retrieved 24 March 2009. ^ "Refuge Opens Bayou DeView to Public Use". Cache River Nat'l Wildlife Refuge. U.S. Fish and Wildlife Service. 18 May 2006. Retrieved 25 November 2006. ^ Leonard, Pat (12 June 2007). "2006–07 Field Season Summary". Cornell Lab of Ornithology. Retrieved 23 March 2009. ^ Leonard, Pat (27 June 2008). "2007–08 Ivory-billed Woodpecker Search Season Summary". Cornell Lab of Ornithology. Retrieved 23 March 2009. ^ Leonard, Pat (7 January 2009). "Searching New Habitat: Ivory-bill Search Season Begins". Cornell Lab of Ornithology. Archived from the original on 18 January 2009. Retrieved 23 March 2009. ^ Lammertink, Martjan; Martin Piorkowksi (6 April 2009). "Out of the Everglades, Onward to South Carolina". Cornell Lab of Ornithology. Archived from the original on 22 April 2009. Retrieved 8 April 2009. ^ KUAF 91.3 National Public Radio (23 October 2009). "Search for the Ivory-billed Woodpecker Suspended". University of Arkansas in Fayetteville. Archived from the original on 13 November 2009. Retrieved 27 January 2010. ^ Dalton, Rex (10 February 2010). "Still looking for that woodpecker". Nature Publishing Group. Retrieved 13 February 2010. ^ Hill, G. E.; D. J. Mennill; B. W. Rolek; T. L. Hicks & K. A. Swiston (2006). "Evidence suggesting that Ivory-billed Woodpeckers (Campephilus principalis) exist in Florida". The Resilience Alliance. Retrieved 30 November 2006. ^ Hill, Geoff (2 August 2009). "Updates from Florida". Auburn University. Archived from the original on 5 June 2011. Retrieved 7 August 2009. ^ "Brinkley, Ark., Embraces 'The Lord God Bird'". All Things Considered. National Public Radio. 6 July 2005. Retrieved 9 July 2006. ^ "Sufjan Stevens – "The Lord God Bird" (MP3)". Npr.org. 27 April 2005. Archived from the original on 1 October 2012. Retrieved 13 November 2012. ^ "Game & Fish Ivory Billed Woodpecker Plate". Arkansas Department of Finance and Administration. Arkansas Department of Finance and Administration. Retrieved 1 September 2018. Jackson, Jerome A (2006b). "The public perception of science and reported confirmation of the Ivory-billed Woodpecker in Arkansas". Auk. 123 (4): 1185–1189. doi:10.1642/0004-8038(2006)123[1185:TPPOSA]2.0.CO;2. Mattsson, B. J.; Mordecai, R. S.; Conroy, M. J.; Peterson, J. T.; Cooper, R. J.; Christensen, H. (2008). "Evaluating the small population paradigm for rare large-bodied woodpeckers, with implications for the Ivory-billed Woodpecker". Avian Conservation and Ecology. 3 (2): 5. doi:10.5751/ace-00255-030205. National Audubon Society (2010): Watchlist entry for the Ivory-billed Woodpecker- Retrieved 2010-FEB-1. Tanner, James T. (1942). The Ivory-Billed Woodpecker. National Audubon Society, N.Y.
U.S. Fish and Wildlife Service (2005). Once-thought Extinct Ivory-Billed Woodpecker Rediscovered in Arkansas. 28 April 2005 Press Release. Retrieved 2006-OCT-6. Wikimedia Commons has media related to Campephilus principalis. The Search for the Ivory-billed Woodpecker. Cornell Lab of Ornithology website with video and sound files. Retrieved 2006-OCT-6. This page was last edited on 12 March 2019, at 23:38 (UTC).